Are you new to blogging? 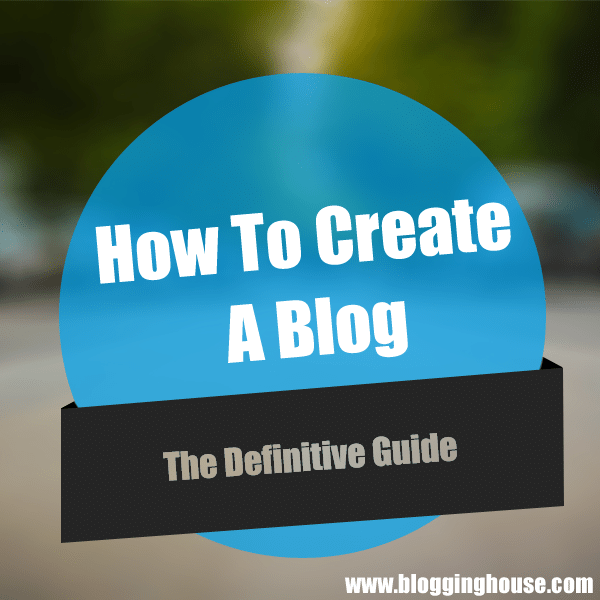 If yes then you must read this guide “How To Create A Blog”. These questions may come in your mind, what is blogging? Where to start? how to do ___ in blogging?. Don’t worry you will get answers in this guide. Blogging House is created to help you learn blogging and make money from it. This blog is having articles from beginners to expert level. We are creating the step by step guides. Today, you will learn how to create a blog or how to start blogging. This blogging guide is created to help beginners to start the journey of blogging. In this guide, you will learn how to start blogging. Believe me it’s really simple and easy. Now, grab a cup of coffee or glass of juice because this post is a little bit long. Don’t worry, it is simple and easy. What is blogging? or Who is a blogger? or What is a blog? These questions may come in the mind of the newbies. The word blogging is derived from the word “Blog”. A blog is a website which share information on different on a specific topic or different topics. A blog usually has features like posts, videos, comments, images, widgets etc. Blogging is a skill to manage blogs. Blogging includes different skills like posting, writing, Search Engine Optimization, editing and publishing post etc. Some professional have all of the skills to manage a blog and other which don’t, hire other experts. A blogger is a person which writes a blog. If you want to be a blogger then you have to be a good writer and you should write quality content. You can say writing is the most important part of blogging. You can write on any topic in which you are expert. For example, you are a cook then you can blog on cooking. Similarly, you can create a fashion blog if you are expert in fashion. Actually, blogging depends on you. Blogging can also be used as a hobby. You can share the stuff which you learn. Everyone can be a blogger because everyone has knowledge in any subject. Now, we shall further discuss blogging and how to create a blog. Blogging is really simple, easy and interesting. It depends on your mind. Before going into deep, here are the reasons to start a blog. It is a way to express yourself and share what you think. It helps you to learn new things. You can make new friends and fans. Blogging makes you a better writer. Blogging increases your knowledge and creativity. It can also use to promote brand, company or business. Blogging can also used as a hobby. Even most bloggers are doing it. Blogging in really full of fun, you can learn new things by it. And the most interesting thing, you can make money doing it. Here the step that this blogging guide covers. If you follow these steps then you will have a blog in just 30 minutes (or more). It is not so difficult, coding knowledge is not required in beginner level. First of all, you have to choose where you have to build your blog. Have you ever heard about WordPress? definitely you had. WordPress is considered as the best platform for blogging. WordPress is mainly used for blogging because of their countless plugins, themes and ways to design and develop a blog. A lot of themes, free and paid. Your blog will fast and secure. Less use of coding, or no use. For powerful CMS, there are Joomla and Drupal but they are not easy to use. That’s why WordPress is preferred. You can say, “WordPress.com or WordPress.org”? You don’t own your blog or you can say your blog can be removed from the web at any time. A lot of limits! You can’t access all features. It’s not good for brands and businesses. So, that’s why self-hosted are recommended. In self-hosted WordPress, you can build your website as you want and take full control on your website. Selt-Hosted cost you some money, but you have to do some investment. WordPress.com is for those who want free hosting from WordPress while wordpress.org is the site to download CMS for your self-hosted website. I hope that you had chosen WordPress. Come one, it’s best one. You ay have confused that what is a self-hosted blog? A Self-hosted website is a website that you created on your own domain and hosting. In this step, you will learn about the domain, hosting and which web hosting you should choose. Domain: Basically your website URL is called domain like facebook.com and Google.com. You can also say the domain is the name of your website. Web Hosting: Web Hosting is the company that put your website on the internet. You have to upload everything there. You can also say that hosting is the place to upload files and visitors use the domain to visit your website. For example, Think that web hosting is your hard drive where you have stored your website files. When anyone want to visit your website he will simply enter domain name and website will open. A domain can cost you around $10 to $14 per year, but many web hosting companies are giving it for free. Many companies are providing good web hosting, Actually service depends on your money. We are proudly hosted on InMotion Hosting. Here are some of the good web hostings. I recommend InMotion Hosting, they are offering business class web hosting for an affordable price. They are offering free SSDs with every plan. They are giving FREE domain with every plan. Install WordPres on just one click. Blogging House visitors will get an exclusive InMotion Hosting discount. Exclusive For YOU and Blogging House readers. Just sign up with InMotion Hosting and install WordPress on one-click. If you have any question or problem then contact their support team which is really responsible. When WordPress will be installed, just login to your WP admin panel. It may look difficult but don’t worry you will learn the things quickly. First go to Settings -> General and customize the important setting. Now go to Settings -> Permalinks. Select the permalink which you like. Anyone except default. I recommend Post Name. After learning WordPress, you will be aware of the other settings. Your blog design is the most important thing which attracts the visitors. A design should be unique, interesting and describes your blog. Yes, your blog design describes your blog. There are a lot of WordPress themes, free and paid. You can install the theme which you like. There are some factors to choose a WordPress theme. Here is an article which will help you to choose a WordPress theme. If you are purchasing MyThemeShop themes, then we have a discount for you. Blogging House visitors can get 70% MyThemeShop Discount. Just apply this coupon code “blogginghouse“. In WordPress, you can easily change themes with a few clicks. Your WordPress theme should represent your blog. If your blog is about cooking then your theme should represent cooking and its related things. Your design should be attractive if you want to make readers read your blog. Just login to your WordPress blog and click on Posts. First write an attractive title of your post. Write the body of your article in the large block below the title. When you are done click on “Publish” button. If you want to write latter then click on “Save Draft”. “Preview” button is to preview your post on your blog. If you want to change URL of your post then see an option of Permalink below the Title. There are a lot of things in this editor which are new to you. We will discuss a few of them. If you want to add an image or video then click on “Add Media”. The text option is to view HTML of the post. Here are the bonus tips to make your blogging journey interesting. Blogging is learned by experience and time. There are a lot of things which you have to learn in blogging. Anyhow, here are some of the BASIC tips. SEO stands for Search Engine Optimization. It is the best technique to increase visitors of a blog. SEO is also a large skill and it requires knowledge and experience. When you open Google and search for anything and websites appears. If you want your website to appear there then you have to improve SEO of your website. For SEO, WordPress plugin SEO by Yoast is best in the business. Well, there are many ways to increase website traffic or visitors but SEO and Socia Media are best one. People use social media websites to connect with the world. If you promote your blog on social media then you can get a lot of visitors. Facebook, Twitter and Google+ are most popular. First of all create social pages of your blog on all social networks. Then, show your content to the people. Yes, you can make money by blogging. As I mentioned in the Reasons To Start Blogging, You can make money by blogging. First of all you have to make your blog able. Uplaod high quality content on it and gather traffic. Advertisement: If you have a lot of traffic, then you can show advertisements on your blog. When people click on the ads, you will get money. Google Adsense, Chitika, and BuySellAds are most preferred advertising networks. Affiliate Marketing: This is one of the best ways to make money online. In affiliate marketing, you promote a product on your website and get commissions on each sale. This is difficult but if you do affiliate marketing wisely then you can get a lot of money. Offering services on your blog, selling ebooks, selling products, selling ad spaces and alot of ways to make money. Blogging requires time and passion. Today, I have told you some of the basics of the blogging. This blog is created to help people in Blogging and improve blogging skills. If you like Blogging House then please subscribe to us.